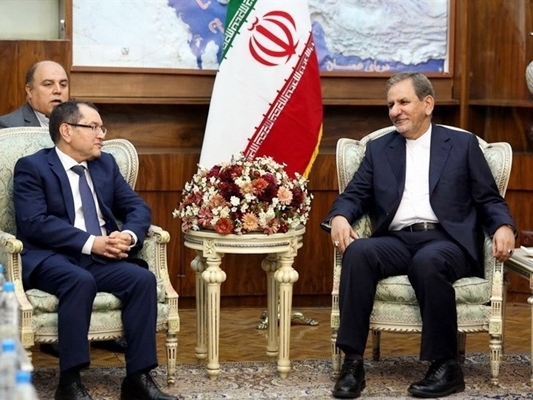 Iranian First Vice-President Eshaq Jahangiri called for Algeria’s more active engagement in the settlement of the regional conflicts. Algeria is expected to play a more active and effective role in resolving the regional woes, particularly the predicaments that some regional countries and the Muslim world are faced with, Jahangiri said in a meeting with Algerian Energy Minister Noureddine Bouterfa, held in Tehran on Saturday. He also voiced Iran’s strong political will to broaden relations with Algeria, especially after termination of the anti-Iran sanctions under the Joint Comprehensive Plan of Action (JCPOA), a nuclear deal between Tehran and the Group 5+1 (Russia, China, the US, Britain, France and Germany). For his part, the Algerian minister said the African country is prepared to take whatever action within the framework of a joint commission to boost cooperation and fulfill the interests. Bouterfa also stressed that Algeria seeks a positive role in resolving the regional crises and establishment of peace. Back in November 2015, Algerian Prime Minister Abdelmalek Sellal paid an official visit to Tehran and discussed closer bilateral relations in a range of fields. He also met with Leader of the Islamic Revolution Ayatollah Seyed Ali Khamenei, who described as “not desirable” the current level of collaborations between Iran and Algeria. The Leader had also expressed the hope that bilateral trade ties between the two countries would be enhanced with Sellal’s trip to Tehran and the joint commission meetings.